HARD TO FIND BOOK, only a very limited number of copies are still available. Machinima offers an in-depth look at where machinima has come from, how and where it is being employed, and its future. It is one of the first books catering to the demand for practical information on this fast-growing and exciting new moviemaking medium. It examines how machinima has been put to use in blockbuster movies, including Troy and The Lord of the Rings. 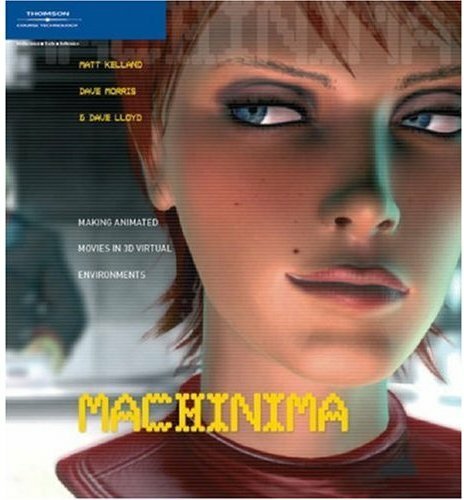 It takes an in-depth look at the production pipeline of machinima movemaking, taking you through every step of the process — from screenwriting techniques and storyboarding through character design, lighting, sound effects, and closing credits. It also guides readers to online machinima movies. • A unique, four-colour, practical book fully based on this new but already hot and groundbreaking filmmaking technology. • Features an illustrated showcase of the best and most innovative machinima movies from around the world. • Offers a unique combination of game programming, animation, and filmmaking. • Includes interviews with current award-winning machinima filmmakers such as Ill Clan, Strange Company, and Fountainhead Entertainment. Dave Morris is a prolific author of fantasy gaming books and the creator of the acclaimed realtime strategy PC game, Warrior Kings. He has worked in both the videogame and TV industry. He holds a M.A. in Physics from Oxford University and has worked as a best-selling author and game designer for 15 years. Matt Kelland and Dave Lloyd have been a game design and production team for many years, with over 100 games to their credit, including the BAFTA-nominated Merchant Princes. Matt has been a journalist, writing on subjects as diverse as African politics, cookery, and computer games. Dave is a software engineer with twenty years experience, during which time he has developed 3D engines, game servers, and compilers. At nGame, where they were both co-founders, Matt and Dave jointly developed some of the first games for mobile phones and interactive television, and managed the company's production studio as well as a worldwide network of external developers. Matt and Dave now run their own company, designing traditional and computer games, creating comics and novels based on computer games, and are leading exponents of the art of machinima — creating animation using game engines.